The CNC Mill is a versatile tool that can cut a wide variety of materials. 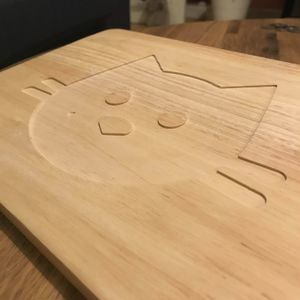 The machine has 3 degrees of freedom meaning that unlike the Laser Cutter, which can only cut 2D Shapes, the CNC Mill can carve shapes in 3 dimensions if you can provide the tool paths to drive it. It does not require an induction to use, but help is available if you need it! 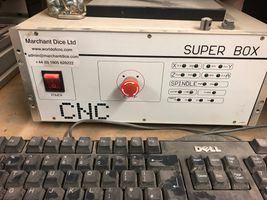 Contact the #CNC channel on Slack if you need help. We operate a bring-your-own-bits policy for this machine due to the high likelihood of broken tools. Links to buy tools are available on the Suppliers page. 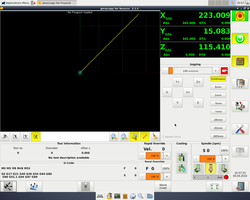 LinuxCNC, with the Gmoccapy interface, is the control software that we use to drive the tool. There is a dedicated computer hooked up to the machine for this purpose. LinuxCNC reads G-Code in the .ngc format. 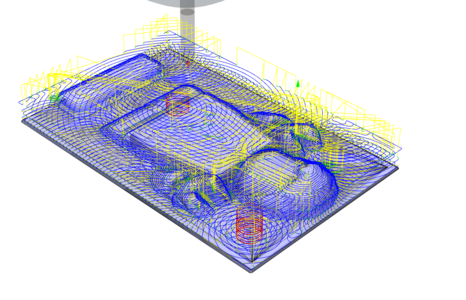 You can use any CAM (Computer Aided Manufacture) package you like to create G-Code at home or on the computers in the Blue Room. 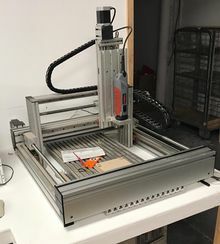 The machine is quite unique in having a dual Y axis stepper setup; however, this does require that the start-up procedure for homeing is carefully followed. The Spindle is a Kress 1050 FME. Its speed is manually controlled via the black dial on the top. It is a good idea to set the spindle speed whilst the spindle is stopped to minimize the operator reaching over the moving machine. Power to the spindle is controlled via LinuxCNC during operation; It will spin up once you start running the G-Code. There is a slide switch on the side of the spindle that should be left on at all times. If it is turned off the tool will simply crash into the work piece without cutting. We have the following collets available, currently stored underneath the monitor for the CNC Computer. This gives slots every 25mm for fixing. We have a small selection of T-Slot nuts that will slide into these channels to provide clamping anchors. The T-Slot nuts will accept an M6 bolt. This machine is best suited to soft materials due to its aluminium frame. Soft woods, such as Pine, can be cut easily with great results. Plywood is a cheap material that can be used to produce simple profiles quickly but is likely to chip if you are doing any moulding operations. Other materials may work with extreme caution; YouTube videos are a good place to start. If you are planning to cut hard materials materials have a couple of spare tools to hand, as you will no doubt break one. Also, do not underestimate the amount of time it will take to clean the machine after the cut. Please leave the machine as you would like to find it. To control the tool you will need to feed it instructions. This is done through G-Code! There are more than a few options available for generating G-Code. Each has different pros & cons and each requires a different set of skills to operate. Inventables' Easel is a 2.5D online CAM package that has a friendly GUI and only requires two small alterations to the code to enable it to function with our machine. Fusion 360 is a great free software package that has tons of CAM functionality built in. Once you have set up your tool paths using the CAM tools in Fusion you can export the setup using the Enhanced Machine Control post processor built in to Fusion 360. A good place to start if you're not sure with CNC programming via Fusion 360 is the NYCCNC Youtube channel. This machine is seriously loud, you must sit very near to it to monitor the job while it’s running and it’s not uncommon for a cutting cycle to be 30 minutes or longer. Hearing damage is a very real risk. Make sure you also warn others in the CNC room of this too. When loading your tool you need to ensure that as much of the shank is contained within the collet as possible. The only exception to this rule is if the job you are running requires a deep cut; then you will need the tool to stick out further. Note: Please ensure that the collet is clicked into the collet nut before locating it into the spindle or it WILL get stuck. Note: If you get an error message or the computer is frozen, restart the PC and try again. Make sure the physical eStop's have been cleared by twisting them and check that the eStop light on the control box is out. Reset The linuxCNC software eStop by clicking the red hand icon in the top right corner. Turn on the machine in the software by clicking the power button just below the software eStop. The machine starts-up in joint mode, in this mode it is possible to move each stepper motor (0,1,2,3) independently but doing so can damage the Y axis. 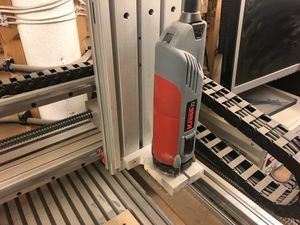 To use the machine we need to be in world mode where we operate X,Y,Z axis, LinuxCNC automatically switches to world mode once all the joints have been homed, but it is important to only ever use the 'Home all' option as homing a single joint at a time will damage the Y axis. The machine should now be ready to go. 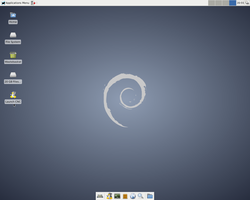 Important There should be no need to home the machine again however if you need to (due to axis slip or a crash) please close LinuxCNC first and start again, as homing in world mode is not supported. After you have homed the machine using the instructions above, Click "Enter auto mode to run programs" on the right hand side menu. On the bottom row of icons you will see a folder icon. Click this to navigate to your ".ngc" G-Code file. G54 is a constant value that is used to provide the offset for the local coordinate system. I.e. 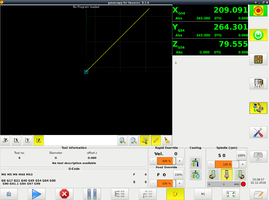 It is used to tell the CNC software where you have secured your work-piece to the table (Set Zero). It needs to be set before any program is run! Enter Manual Jogging mode by pressing the appropriate button on the right hand side or pressing F3 on the keyboard. Open the probing menu by clicking on the blue icon at the bottom. On the bottom bar, press "X=? ", "Y=?" OR "Z=?" depending on the direction you have probed and set the zero point. Note: If you are "touching on", remember to take into account the diameter of the tool. Accounting for the diameter of the tool can be done by typing in half the tools diameter into the probing menu box. 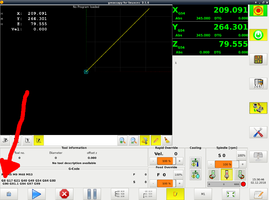 Check its right before running any G-Code by jogging the tool to X=0, Y=0 at a safe Z height; the centre axis of the tool should be over the datum point. If everything has been set correctly, you should see the preview of your G-Code shift to the correct location. Once G54 is set and the code is loaded simply press the Play button located in the "Auto Mode" menu. Don't leave the job unattended and be ready with the Hoover as a lot of sawdust can be produced. 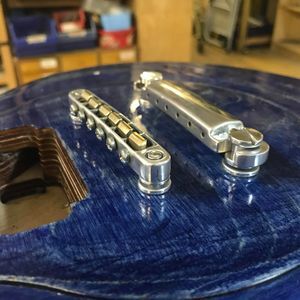 If you have a project that uses this tool please add it to this list. 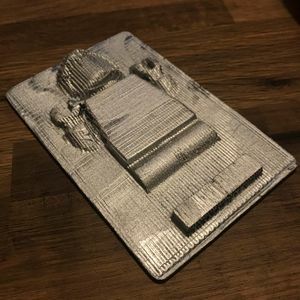 It would be great to see what other people are using the CNC Mill for! 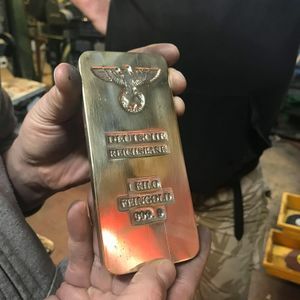 This page was last modified on 17 April 2019, at 22:04.